Dead.tv (2013) – Stigmatophilia's gore splattered corner of insanity. Director of the successful horror film ‘Summer Camp’ trilogy Julian Barrett is down on his luck, but all this is about to change, or is it? He thinks he has scored the job that can resurrect his ailing career, reality TV. The premise is simple, troubled young people are sent to an idyllic camp setting where they will be cured with counselling, and all this will be filmed for the public 24/7. With a million dollars on the table the stakes are high for the contestants, there can only be one winner, but when people start to be eliminated it seems there may just be a higher price to pay. Now I have to admit when it comes to my horror I am a cynical old goat, especially when it comes to new stuff. I guess, like many people, I am tired of the same old, same old, seen it all before *yawn*, and even less than enamoured by the jump scare, CGI laden Cattle prod cinema that seems to dominate the market today. 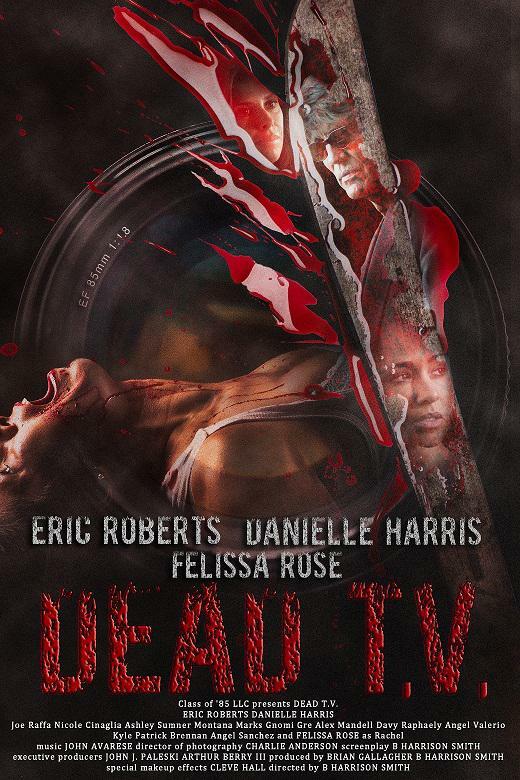 So when I was offered the opportunity to review Harrison Smith’s upcoming feature Dead.tv I have to admit I agreed to do so with a little bit of trepidation. If I have to be truthful I do get sent hordes of crappola to put it nicely, none of which ends up on this site, and for the newer stuff I do occasionally review, it is usually because I have taken the time to seek it out, not the other way round. To be fair Harrison is always very interactive on social media, seems to know his stuff, and from reading the press pack I was slightly relieved that the synopsis sounded promising. The question I was left with however was Harrison can talk the talk but can he walk it? It would not be the first time I have come across something which looks good on paper but does not really translate when it comes to screen time. Therefore when I went into this it was with dubious caution. So was I being fair? Well I guess my previous experience has left me jaded because actually I am going to concede I was wrong, Dead.tv was actually rather good, and far more enjoyable than I had expected. In using the old kids stuck out in a lakeside summer camp scenario it had a nice hark back to the old slasher classics, but the story lifted it up and gave it a modern edge, something which could have gone one of two ways, thankfully landing on the positive side and dare I say it in the process making it quite refreshing. In very much the same way as The Burning, Dead.tv does not bash into the action straight away, (when it comes to campside killings) there is a good half an hour developing the story and the characters. Now if you are of the ‘attention span of a peanut’ brigade who want to have a fast racing horror with things jumping out every two seconds, this is not the film for you. There are some lengthy dialogue scenes at the beginning which I felt really set the mood, and the acting all round is nice and solid with a good natural flow (a little on that in a moment). The actual story, well I am not going to give anything away, all I will say is it develops nicely and given the predictable setting of the piece, actually challenges the confines of that. It did keep me guessing until at least about three-quarters of the plot had gone along which is rare. I always enjoy a little speculation as a film develops, and take a smug satisfaction in having it all figured out early on, but then my moment of celebration is always sadly tinged with a feeling of disappointment that it did not get me, in this case however Dead.tv did get my little cogs working. The ending in particular just makes the film, and there are some excellent scenes of tension as it builds to its climax. For the cast, well I could not identify any weak links really, some of the minor characters could have benefitted from more screen time, but as this was down to the leads being developed in more depth than expected I felt it was a worthwhile compromise. Actually it is worth noting that any time spent on character development in a slasher is rare so this was a bonus for Dead.tv. It certainly adds to the tension factor when the inevitable deaths start to mount if you actually know who the people are. Acting veteran Eric Roberts was stand out in his role as smug director Julian Barrett making it look effortless, he brings to his role an air of maniacal ego that seems to just ooze out of him ( I am sure he is a very nice guy really). 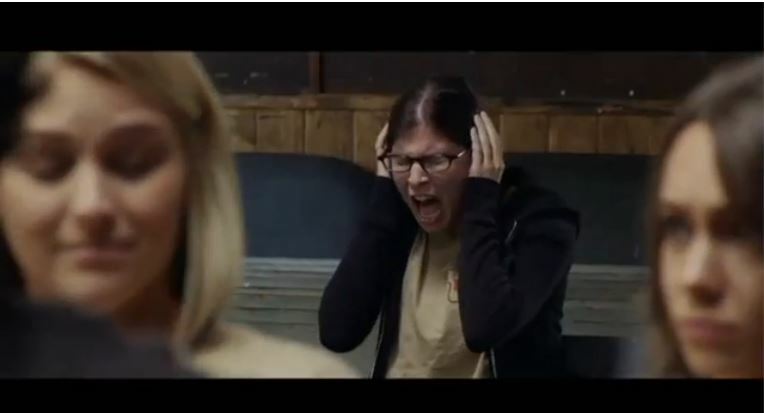 Sleepaway Camp icon and genre Pro Felissa Rose, playing former horror star Rachel Steele turned camp counsellor , not only brings some vintage horror kudos to the affair but provided some nice wide-eyed Scream Queen moments. Danielle Harris again another genre mainstay is very solid in her scenes as the local sheriff, and it would have been nice to see a few more scenes with her. For the younger cast Nicole Cinaglia (who incidentally just appeared in Alpha Girls which I recently reviewed) as Adrienne stood out as especially fragile and brooding in her part, and Joe Raffa was great as the seething and selfish Novak (he is also credited as the film editor for this picture ). One thing I did like about the piece and the performances in general was the way in which given the well used scenario there was some bending and omitting of standard genre troupes, some I can talk about, others not as it will add unnecessary spoilers. Mainly though these were down to the nature of the younger members of the cast, who were older than the usual slasher ‘fodder’ so to speak and this gave scope for some intelligent performances all round. The camp participants were a far cry from your normal brainless teenage crowd, who embark on wild beer and nakedness parties around the lake leaving themselves open to all manner of unseen danger, they actually questioned things which helped in building up the story, and gave the opportunity for some dry witty dialogue. Before you start to worry though, that is not saying the film is prudish, a particular scene featuring some bodily fluids which are not blood will put paid to that fear ( I am wondering if this gets a UK release what the good old BBFC will make of that). Now for the killings, and I know you are all thinking yes, yes tell us about the blood. Now I have seen it remarked on by another reviewer they wanted more blood. It is true the killings take a while to get going and there are gaps between them, but I felt on the whole this fitted the serious nature of the piece, when they did come they were worth waiting for. Cleve Hall (Terrorvision, Ghoulies, Troll to name a few) who did the effects has made some nice choices, and I did not detect anything that was overly CGI, looking very old school, which made me a very happy bunny indeed. An arrow in the eye, and death by forced consumption of cleaning products were my personal highlights, but by who and why, well you are just going to have to watch and find out for yourself. Before I wrap things up I also want to mention the cinematography in this feature, because for an independent, it is extremely professionally shot. The locations are fantastic, using a real camp makes for an authentic feel, and there are some nice set pieces in the way in which this is filmed which really add to the mood. The parting shot, which again I am not going to discuss, but with the lines leading up to it I have to say it left me with a little smile on my lips and made for a fantastic ending. So there you go, well shot, solid acting, gory kills, and an interesting story, what more can you ask for? Dead.tv really surprised me and I am eager to find out where Harrison Smith goes from here. With his next feature Zombie Killers: Elephant Graveyard coming out next year it looks like we will not have to wait long to find out. You can check out the Official Dead.tv website here. For information on ZEG try here. Stiggy’s Film of the Day Night of the Templar (2012). Dr. Catsu reviews Return to Sleepaway Camp (2008). Alpha Girls (2012) (review) Satanic sorority girls will stop at nothing when it comes to getting what they want. The Gore Splattered Corner welcomes writer/director Harrison Smith: Camp Dread, Zombie Killers Elephant Graveyard. « Stigmatophilia's gore splattered corner of insanity. Scream Magazine: The UK’s biggest selling horror magazine: PRINT IS DEFINITELY NOT DEAD! « Stigmatophilia's gore splattered corner of insanity.